The 64 oz Rambler Bottle is a next-level insulated bottle. 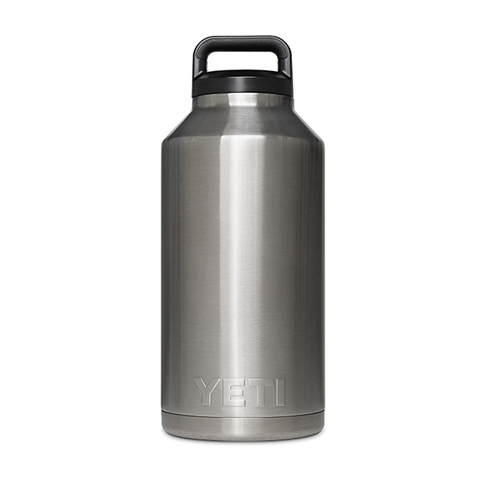 The perfect addition to your rough commutes, day hikes, or kayak sessions, this Rambler Bottle has the power to keep your water chilled or coffee hot until the last sip. Like the rest of our Rambler series, the 18 oz Rambler Bottle features a No Sweat design to keep condensation from collecting. Its 18/8 stainless steel construction stands up to even the toughest of conditions and you’ll find the leakproof, insulated TripleHaul cap protects your truck cab or day pack from any unnecessary spills. Unlike narrow-mouthed drink bottles that are a hassle to fill or rinse, the Rambler Bottle features Over-the-Nose technology for easy loading, drinking, and cleaning. And it’s BPA-free. In other words, the Rambler Bottle is the only insulated container for cold (or hot) beverages that’s built for the wild.